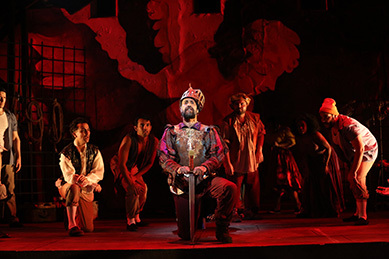 Every year, the Westport Country Playhouse in Westport, Connecticut presents one musical, and for the 2018 season, their big production of the Tony-award winning musical, Man of La Mancha written by Dale Wasserman, with music by Mitch Leigh, lyrics by Joe Darion, and directed by Mark Lamos, was a triumph of a masterpiece, over-the-top wonderful! 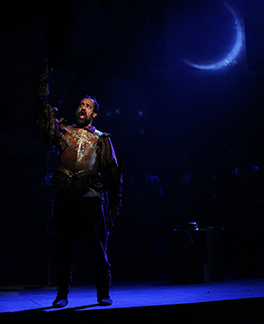 Starring Philip Hernandez as Cervantes/Don Quixote and a brilliant cast of 14, If you only go to see one play this year, this is the one to see! 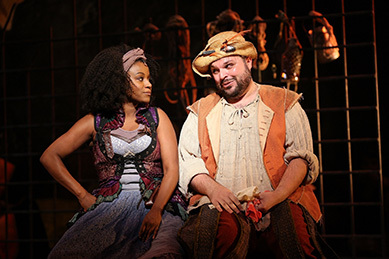 Man of La Mancha runs until October 14, 2018 at the Westport Country Playhouse. Throughout the years, we have seen many plays directed by Mark Lamos at the Westport Country Playhouse whose genius as a director has been a constant no matter the genre, be it comedy, drama, or a musical. With his 2018 production of Man of La Mancha, Mark Lamos has outdone himself. We saw the play on opening night on Saturday, September 29, 2018, and it shined brightly from the opening line to the close with memorable moments of acting and songs by the inspired dream of a cast. It was a night of theatre magic, one which would do playwright Dale Wasserman proud. 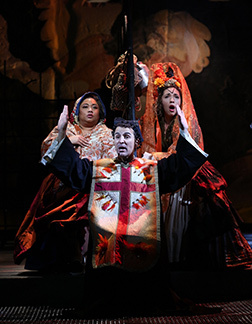 Set in a prison in the city of Seville, Spain, the set design by Wilson Chin was fabulous, the costume design by Fabien Fidel Aguilar was sumptuous, the orchestra was wonderful, and the performance flowed seamlessly. The 14 actors were extremely well cast with memorable performances given by all, however there were a few exceptional performances that deserve noting including that by Philip Hernandez who delivered an amazing performance in his role of Cervantes / Don Quixote using his extensive Broadway experience to give the role deep humanity, one who sees the world not as it is, but as it should be, he is the quintessential dreamer who dares to dream "the impossible dream." 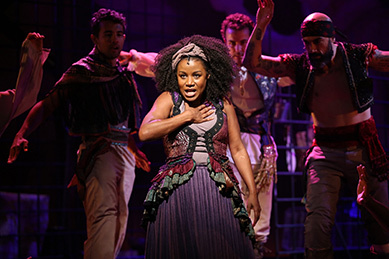 A few of the other notable performances included that by Gisela Adisa who excelled in her roleof Aldonza / Dulcinea where her powerful and lovely voice enriched her performance as the sassy, sultry, and sardonic Aldonza the scullery maid, who becomes the lovely Dulcinea in the imagination of Don Quixote. Tony Manna in the role of Sancho Panza / Prisoner, Cervantes' loyal squire and friend had the audience rolling in the aisles with his perfect delivery of his humorous lines. Westport, Connecticut native, Clay Singer, (whom we had previously seen in the 2017 performance of Romeo and Juliet) shined in his role as the Duke / Carrasco / Prisoner, Paola Hernandez was outstanding in her role of Cervantes' niece, Antonia / Prisoner,and Lulu Picart delivered the goods in her roles of Maria / Housekeeper / Prisoner and played guitar onstage. From the play's opening to the company finale, it was a starry night of theatre at its very best, one that deserved, and received, a standing ovation and shouts of bravo! Well done and hats off to Mark Lamos, to the talented cast and the musicians, and to the creative team on bringing the best of the best to the Westport Country Playhouse. Until next time, keep supporting the arts! 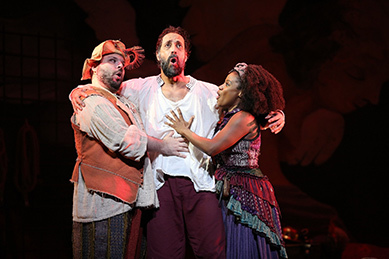 Man of La Mancha performance schedule is Tuesday at 7:00 pm, Wednesday at 2:00 pm and 8:00 pm, Thursday and Friday at 8:00 pm, Saturday at 3:00 pm and 8:00 pm, and Sunday at 3:00 pm. Special series feature Taste of Tuesday, LGBT Night OUT, Opening Night, Sunday Symposium, Open Captions, Thursday Talk Back,Together at the Table Family Dinner, Playhouse Happy Hour, and Backstage Pass. For information on the play or to purchase tickets, please call the box office at +1-203-227-4177 or call the toll-free number at 1-888-927-7529 or visit them on the website at www.WestportPlayhouse.org. The Westport Country Playhouse Box Office is open during Performance Days Tuesday through Friday from 12:00 pm until 8:30 pm, Saturday from 11:00 am until 8:30 pm, Sunday from 11:00 am until 3:30 pm, and is closed on Monday. Non-Performance Days, the Box Office is open Tuesday through Friday from 12:00 pm until 6:00 pm and is closed on Monday. The Westport Country Playhouse named as "Theatre Company of the Year" in December 2013 by The Wall Street Journal, opened in the 1930s in a transformed 1835 cow barn, which has, and continues to attract, a "who's who" of prominent actors. Looking at the framed posters of past shows that line the lobby walls was like entering an encyclopedia of the arts. A few of the many renowned actors who have appeared on the stage there include Ethyl Barrymore, Dorothy and Lillian Gish, Tallulah Bankhead, Gloria Swanson, Don Ameche, Hume Cronin and Jessica Tandy, Jane Fonda, Danny Aiello, Blythe Danner, Jill Clayburgh, Richard Dreyfus, Whoopi Goldberg, Liza Minnelli, Bernadette Peters, Lynn Redgrave, Gene Wilder, and Westport residents Joanne Woodward and Paul Newman. "Westport Country Playhouse, a not-for-profit theater, serves as acultural nexus for patrons, artists and students and is a treasured resource for the State of Connecticut. There are no boundaries to the creative thinking for future seasons or the kinds of audiences and excitement for theater that Westport Country Playhouse can build." For information on upcoming events and other performances, please visit the website: www.WestportPlayhouse.org. Follow the Westport Country Playhouse on Facebook at www.Facebook/WestportCountryPlayhouse. © September 2018. LuxuryExperience. www.LuxuryExperience.com. All rights reserved.